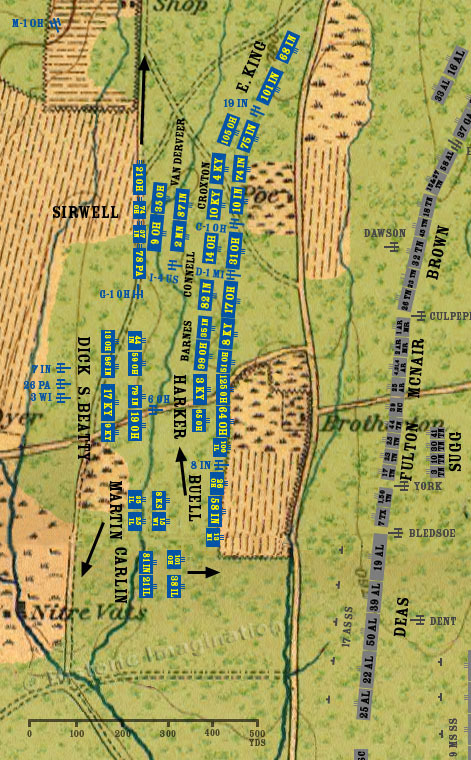 West of the Poe farm, Sirwell’s brigade continues its march north to reunite with the rest of Negley’s division. Van Cleve’s division halts behind Wood’s division, but cannot find anywhere to insert itself into the front line. Davis’ division also halts behind Wood. Buell recalls his two right regiments to his supporting line, giving Carlin’s brigade room to deploy. Finding Buell in his way, Martin retires behind Carlin.